Current and former intelligence officials laid into President Donald Trump and his allies in the wake of FBI deputy director Andrew McCabe's firing late Friday night. 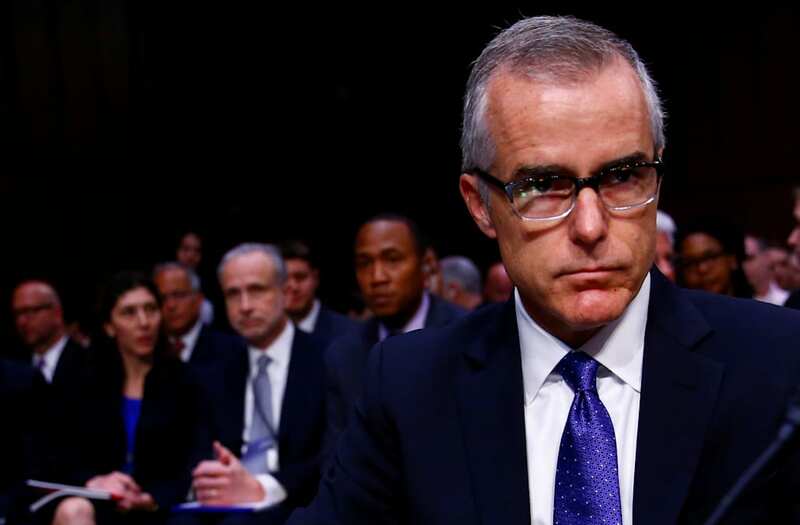 McCabe said in a statement that he was "singled out" and fired because of the events he witnessed after Trump fired FBI director James Comey last year. One former FBI official said the firing was a "political assassination" on McCabe and "a savage broadside on the institution he served." Another official, who currently serves in the FBI, said they were "shocked" and "not sure how to process" the news. FBI deputy director Andrew McCabe was fired on Friday, one day before he was set to retire, leading current and former colleagues in the intelligence community to defend him in a burgeoning battle with President Donald Trump and his allies. "It is hard for me to find the words to express my anger at the moment," said Frank Montoya, Jr., a former FBI agent who worked closely with McCabe before he retired in 2016. "This is a political assassination on a good man and public servant. It is also a savage broadside on the institution he served." McCabe was forced out of the FBI earlier this year amid an internal investigation by the Office of the Inspector General. That probe looked into his approval of unauthorized disclosures to the media in October 2016 related to the bureau's Hillary Clinton email probe. The Department of Justice inspector general, Michael Horowitz, concluded in a report that McCabe was not forthcoming during the OIG review. The full report has not yet been released. The FBI Office of Personal Responsibility subsequently recommended that Attorney General Jeff Sessions fire McCabe, according to The New York Times. Sessions said in a statement Friday that "both the OIG and FBI OPR reports concluded that Mr. McCabe had made an unauthorized disclosure to the news media and lacked candor — including under oath — on multiple occasions." Montoya scoffed at Sessions' conclusion that McCabe "lacked candor" while serving as deputy director. "EVEN if Andy lacked candor — and he said that wasn't the case — one does not get fired one day before one is eligible" to retire, Montoya said. "I've never heard of that happening before in 26 years of service," he said. One current FBI official, who requested anonymity in order to speak freely, expressed similar shock. "You'll have to come back and ask me later," the official said in a text message Saturday morning. "Not sure how to process this right now. Others feel the same. Shocked." The FBI deputy director's ouster is significant because it, like the removal or resignation of several other senior DOJ officials, came following a string of public attacks from Trump, who accused him of corruption and bias. Trump tweeted on Friday night that McCabe's firing was "a great day for the hard working men and women of the FBI — A great day for Democracy." "Sanctimonious James Comey was his boss and made McCabe look like a choirboy," he continued. "He knew all about the lies and corruption going on at the highest levels of the FBI!" John Brennan, the former CIA director and a frequent Trump critic, hit back at the president Saturday morning. "When the full extent of your venality, moral turpitude, and political corruption becomes known, you will take your rightful place as a disgraced demagogue in the dustbin of history," Brennan tweeted. "You may scapegoat Andy McCabe, but you will not destroy America...America will triumph over you." Meanwhile, congressional Republicans began lobbing attacks at the former FBI deputy director after he testified before the House Intelligence Committee on December 19. Soon after McCabe testified, media reports surfaced which said McCabe told the committee he could corroborate former FBI director James Comey's account of his conversations with Trump prior to his firing last May. Then reports emerged that the inspector general's office would speed up the portion of its investigation into the handling of the Clinton email probe that related to McCabe. And shortly after, Trump referenced a Washington Post report saying McCabe planned to retire in early 2018, when he would be eligible for full pension benefits. "FBI Deputy Director Andrew McCabe is racing the clock to retire with full benefits. 90 days to go?!!!" Trump tweeted. "I don't know if anyone from the White House or within the Department influenced the IG," McCabe told Politico in an interview that took place earlier this month, before his firing. "It's a striking coincidence. One that can't be seen outside the context of the president's own public communications." Montoya said the appearance that career FBI officials "were complicit in this egregious action makes it even worse." "I anticipate the credibility of the DOJ IG and FBI OPR are going to take a serious hit amongst the rank and file," he added. "Folks are going to think that if it can happen to the deputy director, it can happen to anyone." McCabe was one of three top FBI officials whom Comey apprised of his conversations with Trump, during which Comey said Trump asked him for his loyalty and to drop the FBI's investigation into former national security adviser Michael Flynn. All three officials have since been fired, resigned, or reassigned within the bureau.